Today’s guest blog is written by Caroline Harmsworth who commented that she liked my recycling challenge post, a subject “close to her heart”. I have never met Caroline in real life but I asked her to tell us more about her approach to recycling, which she has kindly done. Now her sons have left home she looks forward to doing more sewing and recycling, and some more challenging projects. I have always enjoyed putting together outfits. The dressing up box at home was my first inspiration, but I was further encouraged by bags of cast offs from neighbours, my lovely sewing teacher at school, charity shop finds at university, the flea markets of Paris in my early twenties, and then the amazing fabrics and colours of West Africa a few years later. 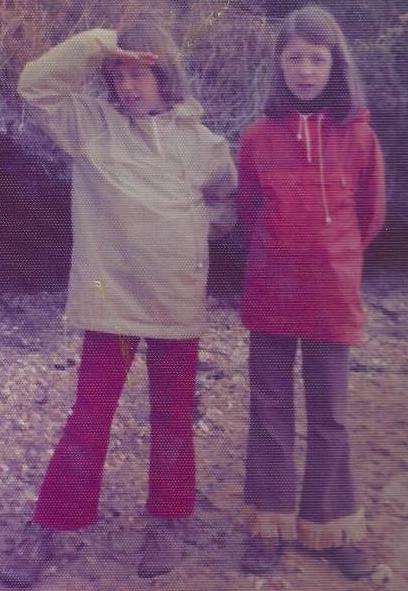 I was born in 1962 and I think many children’s clothes were hand-made in those days. The shop bought stuff was dull and my mother was used to war-time thrift. 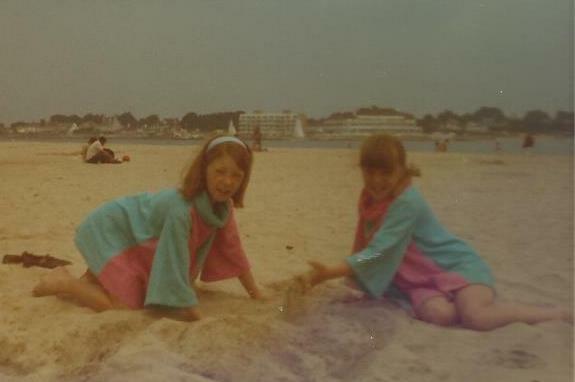 She liked to sew simple styles and made full use of the 60s and 70s vibe with lots of interesting colour like these beach tunics my sister and I are wearing. Early on I started to adapt clothes. I was constantly growing and I had an ingenious idea to lengthen my dull brown trousers with some fringed braid, so that they would fit. I was obviously not put off by the dubious fringing, and had another go in my early 40s, starting with a pair of men’s Charity shop cord trousers that I felt needed a makeover. Through my teens I raided my mother’s wardrobe and made items to wear from her cast offs. Two beautiful Thai silk scarves became tops. I hope I asked permission before chopping into that lovely fabric! I also engaged in more traditional sewing projects like this cotton puff sleeved blouse and denim skirt. I think I may have been in my Waltons phase at the time! University was a time when Punk was dominant, and I often put an outfit together that day from various charity shop items. This involved dying, patchwork and refashioning different textiles. I’d dye material and patch stuff together that I had found in charity shops ready for that evening’s party. But sometimes the outfit was already perfect. I still wear this early Laura Ashley shift that was given to me by a neighbour in 1980. I wore it for student parties, without the belt. When I had children, I bought their clothes from second-hand sales (Ebay didn’t yet exist) and altered them, or made outfits for them from scratch. The star fabric for Joe’s shorts came back with me from West Africa. I live in Wiltshire now and still shop in charity shops, and have several items that I can just wear as found. 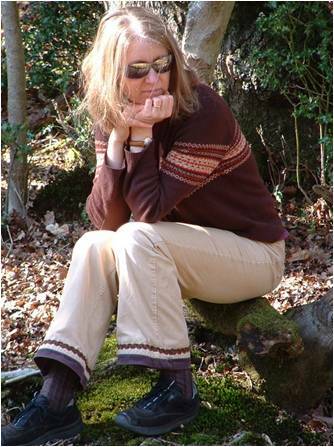 Some finds need updating a little, such as this knitted waistcoat where I changed the buttons. The waistcoat is two sizes too big, but luckily I like the ‘gamin’ look. Some items need complete revamping. This velvet top started life as a cushion cover. The buttons came from a shop called ‘Lin et L’autre’ that I visited whilst on holiday in Normandy, and the facings were fat quarters from the V&A quilting exhibition. And, while I loved the fit of this simple evening dress, black isn’t really my colour – I made it more ‘me’ by adding the petrol blue silk band. In terms of my ‘personal style’, it is probably ‘scruffy round the edges’! I think the picture of me in the waistcoat is a fair indication of my everyday ‘style’. I have never worked in London and never in an office, so formal work wear doesn’t feature in my wardrobe. I tend to layer pattern and texture and mix up luxury fabrics with workaday stuff. I hardly ever tuck things in, tend to wear flat boots or shoes and accessorise with loosely tied scarves rather than jewellery. My work demands that I wear clothes that are easy to move in and that can take a bit of battering. My hobbies are outdoors – gardening and walking, although I also like to cook and to paint or make. None of this makes it easy to wear feminine clothes, so I enjoy the opportunity to dress up ,and treat it as an excuse to indulge my theatrical side! At the top of this post you can see what I wore for an open air opera in the summer. I’d found the skirt in a charity shop that morning and the hair piece was made from various bits of silk and artificial flowers. Love your style Caroline – and it occurs to me that were you inhabiting the work spaces of many London enterprises, social or commercial, you would fit right in! Hi Caroline, thank you for some really nice recycling ideas and outfits. I particularly like the cords extensions! Do you still wear those Thai silk tops? I really enjoyed compiling this so thank you Kate. I don’t wear the silk tops any longer – they are a little short and reveal a little too much midriff nowadays. But I think I may have another go at adding interesting hemlines to trousers. I love to see a women comfortable with her style……it carries weight and appeal. Bravo for staying true to yourself (and ot just buying anything off the rack) and finding a creative outlet in which you can express yourself daily. Well done!! Bravo Caroline, you’re dressing to your truth in an authentic way. You reflect an eclectic style rather than fashion. When it comes to choosing clothes that can be wonderfully liberating. One of my pet peeves about the programme What Not To Wear was that while it had good advice it was somewhat generic in style. I agree with Joyce that having confidence in how you look is very appealing. Lovely, fun style, embodying openness and creativity. Great inspiration!